Children love to look at pictures of other smiling, happy kids! 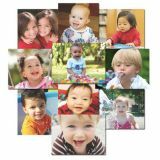 These adorable 14" x 19" posters, featuring playful toddlers, are on a heavy card stock with durable gloss varnish. Perfect for decorating your classroom or as discussion starters. Set of 10 posters.